Student loans are a significant challenge for many of our Roots of Personal Finance members and many people in general. Currently, there is $1.48 trillion owed among 44 million borrowers. The amount of debt that's carried for student loans has surpassed auto loans and credit cards and comes second to mortgage debt. Many people owe a lot of money for their education. Over the years I have coached a lot of individuals and families, and paying back student loans is a challenge for many of them. It can be tough, and it can sometimes seem darn near impossible to pay them off. But, it is doable, and you can do it, too! Paying off student loan debt, and indeed any debt is hard work. That’s why I always suggest that people think twice, heck even three times before they ever go into debt. I wish they made it as easy to get out of debt as they do to go into it. There's no magic potion to paying off your student loan debt. Searching the Internet or talking to friends may lead you to believe that there is a wonderful program that can wipe your debt out in 90 days or less for a low price of $29.95. I'm exaggerating here, but I'm not far off if you’ve seen some of the ridiculous ads out there. There is no pass to easy street here; it’s going to take some hard work and patience to reach this goal! I noticed a trend as I’ve coached people. Many don’t know how many loans they have, what kind they have, how much they owe, if they have federal or private loans, what interest rate they're paying on each loan, and, in extreme cases, if their loans are in good standing or have gone into default. Before you can make a plan of attack, you have to know what you’re up against. It’s time to get organized and understand everything about your loans. Teetering on the edge of missing payments. When money gets tight, sometimes you have to make tough choices about what expenses are going to get paid. Don’t make the mistake of letting your loans go into default. It’s better to be proactive and doing so will likely be less burdensome for your future. Once you organize your student loans, it’s a great idea to figure out what options you have available to you if you can’t afford to make your payments. Repayment plans are something to look into and understand even if you are currently able to afford your payments. Depending on if you have federal or private student loans will determine what options you have. If you hold federal loans, the Department of Education has a multitude of different repayment programs for borrowers who are experiencing difficult times. You can read more about those here. If you hold private student loans, it is likely you won’t have as many options available, but I would suggest that you speak to the creditor that holds your loans to see if they offer any repayment options during a hardship period. Please note—taking advantage of repayment programs is a way to help you during a difficult time. In many cases, these programs will keep you in debt longer and will cost you more money in the long run. To be clear, these are not good options to pay off your loans fast, but will help you stay afloat if the going gets tough. It’s better to participate in these programs rather than letting your loans go into default. Should you refinance or consolidate? Now that you’re organized, you will be in a much better position to decide on refinancing or consolidating your loans. 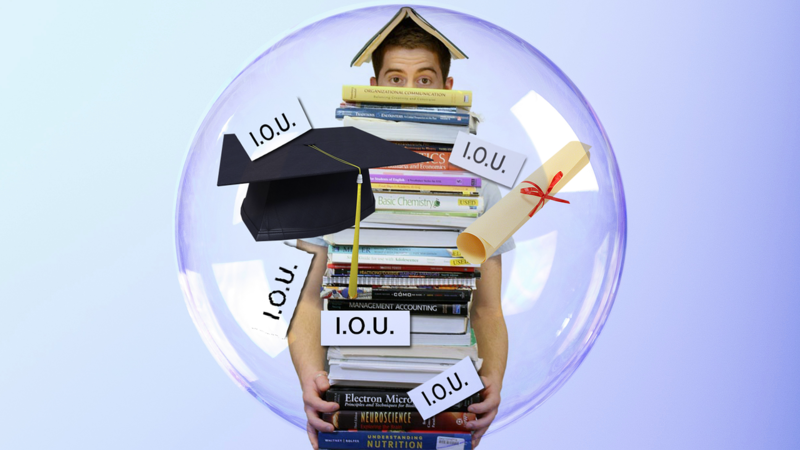 You hear these terms a lot when it comes to student loans, but should you do it? There isn’t a clear-cut answer, and everyone’s situation is different. Refinancing may help you lower your interest rate. However, doing so may cause you to lose many of the benefits that come with federal student loans, like the repayment plans we discussed above. Many people consider consolidating to make life easier. Rather than having a bunch of smaller loans, they opt for one larger loan with one payment. On the outside, this can appear to be a good idea—one easy low monthly payment, who wouldn’t want that? Not so fast! Debt consolidation has plenty of drawbacks. First, consolidating will take all of your interest rates and average them together to establish your new interest rate. Consolidating removes your ability to pay off student loans that held higher interest rates or lower balances. Consolidation also is more expensive over the long haul. Sure your monthly payment goes down, but that means you’re paying less on your debt, which means you will be in debt longer, and paying interest over a longer period. It’s important that you do your homework and look at all the positives and negatives when refinancing or consolidating your loans. For more information, studentloanhero.com is a great resource for evaluating the pros and cons. Earlier I said there is no magic potion, but there's a really cool tool that will not only help you pay off your student loans, but also help you pay off any other debt you might have. The results can feel pretty spectacular, almost MAGICAL! This tool will help you save for an emergency fund, cut spending, save for retirement, save for a down payment for a home, or fund your next tropical vacation. The tool is called a budget. It’s amazing how powerful a budget can be, but it’s shocking how few people do one. If you want to pay off your debt and stay out of debt, a budget needs to be a part of your game plan. I love to read debt freedom success stories. Whether they're stories from our Roots members or articles I find online, it's motivating and inspiring to read about other people’s success when it comes to money. Do you know what’s common in every single one of these stories of financial success? SACRIFICE! If you want to pay off your student loans quickly, you’ve got to sacrifice. Sacrifice isn’t always fun, but it's always worth it. Keep in mind, I don’t suggest you sacrifice for the rest of your life, but temporary sacrifice can go a long way in paying off debt and kicking those student loans to the curb. Make extra cash and pay more than the minimum payment. The more you work, the more you make! Work equals money! Picking up extra hours, getting a side hustle or a second job can be great ways to chip away at your debt. Just like we mentioned, you’re going to have to sacrifice some of your time, but keep in mind that its a temporary sacrifice. Working hard now means that you get to make life more comfortable in the future when you’re no longer making payments to Sallie Mae. Also, any cash windfalls you receive should go to pay down debt. If you get a bonus, a raise, or a tax return, as tempting as it can be to spoil yourself, don’t fall into that temptation! Send that money in to pay off your debt. The faster you can pay off those student loans, the better off you’ll be! Eat, sleep, and drink paying off your student loans. We can sit and talk about math and interest and numbers all day long. However, attitude is everything when paying off your student loans. You have got to get crazy serious about paying off debt, and you have to be very focused on achieving your goal. This might seem over the top at first, but I see it all the time in Roots of Personal Finance. Those who get super focused and intense about paying off debt are the ones I see having the most success. It’s amazing what you can do when throwing out all the excuses and you set your mind to something. Another key ingredient to getting out of student loan debt is patience and consistency. As I mentioned earlier, there is no miracle fix here. Paying off your student loans is going to take some time, and you have to be committed for the long haul. Think about it; you didn’t get your degree in 90 days, what makes you think you’re going to pay off your student loan debt in 90 days? It isn't going to happen. But, if you implement the steps we provided here, you’ll be surprised at how fast you can pay down that debt. That was a lot of information. Let's lighten things up a bit. Check out this video by Dee-1, who's a middle-school teacher turned rapper. Dee-1 is an advocate for personal financial health, saving money, paying off debt, and living within your means. Check out his hit song, Sallie Mae Back!